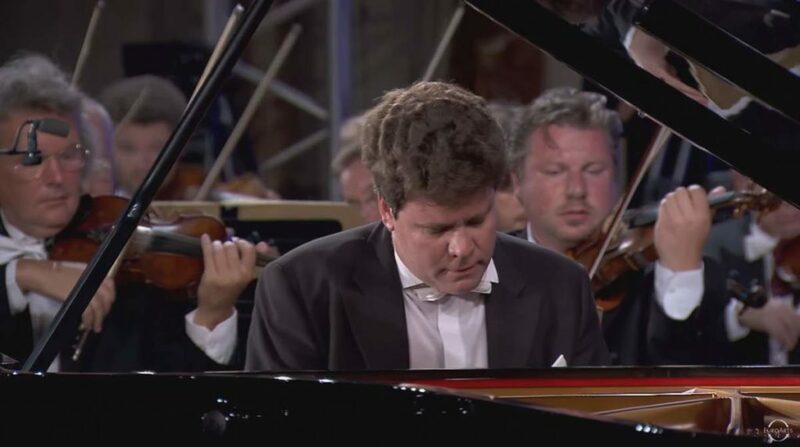 Accompanied by the Saint Petersburg Philharmonic Orchestra, Russian classical pianist Denis Matsuev performs Sergei Rachmaninoff’s Piano Concerto No. 2 in C minor, Op. 18. Conductor: Yuri Temirkanov. Recorded during the Annecy Classic Festival 2013 at the Sainte-Bernadette Church, Annecy. Published by the EuroArts channel. The work is composed between the autumn of 1900 and April 1901. It is scored for 2 flutes, 2 oboes, 2 clarinets in B♭ (I mov.) and A (II & III mov. ), 2 bassoons, 4 horns in F, 2 trumpets in B♭, 3 trombones (2 tenor, 1 bass), tuba, timpani, bass drum, cymbals, solo piano, and strings. 01:15 Moderato: C minor The opening movement begins with a series of bell-like tollings on the piano that build tension, eventually climaxing in the introduction of the main theme. In this first section, the orchestra carries the Russian-character melody while the piano makes an accompaniment made of rapid oscillating arpeggios. After the statement of the long first theme, a quicker transition follows until the lyrical second theme, in E flat major, is presented.The agitated and unstable development borrows motives from both themes changing keys very often and giving the melody to different instruments while a new musical idea is slowly formed. The music builds in a gradual climax as if the first bars were to be repeated, but in the recapitulation the theme is presented as unique to the first statement.While the orchestra restates the first theme, the piano, that in the other occasion had an accompaniment role, now plays the march-like theme that had been halfly presented in the development, thus making a considerable readjustment in the exposition, as the main theme, played by the orchestra has become an accompaniment. This is followed by a piano solo, which leads into a descending chromatic passage and concluding with an eerie horn solo. From here the last minutes of the movement are placid until drawn into the agitated coda, and the movement ends in C minor fortissimo. 12:02 Adagio sostenuto – Più animato – Tempo I: C minor -> E major The second movement opens with a series of slow chords in the strings which modulate from the C minor of the previous movement to the E major of this movement. The piano enters, playing a simple arpeggiated figure. This opening piano figure was composed in 1891 as the opening of the Romance from Two Pieces For Six Hands. The main theme is initially introduced by the flute, before being developed by an extensive clarinet solo. The motif is passed between the piano and other soloists before the music accelerates to a short climax centred on the piano. The original theme is repeated, and the music appears to die away, finishing with just the soloist in E major. 22:15 Allegro scherzando: E major -> C minor -> C major The last movement opens with a short orchestral introduction that modulates from E (the key of the previous movement) to C minor, before a piano solo leads to the statement of the agitated first theme. After the original fast tempo and musical drama ends, a lyrical theme is introduced by the oboe and violas. This second theme maintains the motif of the first movement’s second theme. After a long period of development tension is built up considerably. Near the end, Rachmaninoff restates the second theme in loud, fortissimo orchestration. After this a fast, ecstatic and very triumphant coda draws the piece to a close, ending in C major. Denis Leonidovich Matsuev (born June 11, 1975) is a Russian classical pianist. He won the 11th International Tchaikovsky Competition in 1998 at age 23. He is an artistic co-director of the international Annecy Classic Festival in France with Pascal Escande. He is also the organizer and artistic director of two international festivals in Russia, Stars on Baikal in his native city of Irkutsk and an annual music festival Crescendo. Matsuev has also assisted with organisation of other regional festivals in the Urals in the cities of Perm, Orenburg and Cheliabinsk. He is also the current head of the New Names Charitable Foundation, which launched Matsuev’s performing career and continues to support the musical education of gifted children in the Russian remote regions. In October 2008, Alexander Borisovich Rachmaninoff, the grandson of the composer Sergei Rachmaninoff, invited Denis Matsuev to become an artistic director of the Sergei Rachmaninoff Foundation. 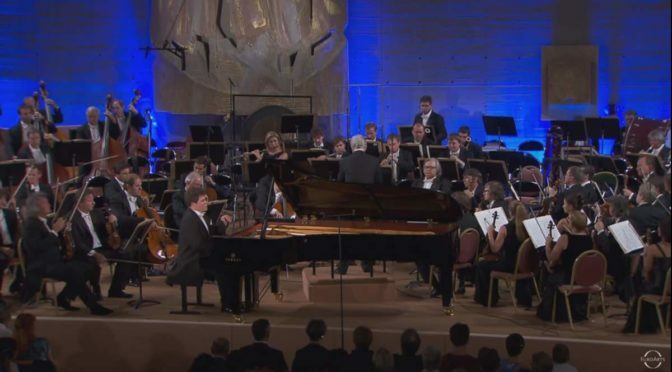 As a part of his collaboration with the Sergei Rachmaninoff Foundation, Denis Matsuev performed and recorded little known Rachmaninoff works on the composer’s own, a Hamburg ‘D’ Steinway grand piano at the Rachmaninoff Villa Senar in Lucerne. In 2013 – Rachmaninov’s 140th anniversary year – the Foundation presented series of concerts in the most prestigious concert halls throughout Russia and Europe. In 2012 Denis Matsuev became the artistic director of I International “Astana Piano Passion” Festival and Competition as well as the artistic director of International Festival and Competition “Sberbank DEBUT” in Kiev in 2013. In May 2016 Denis Matsuev became the artistic director of I International Competition for young pianists in Moscow “Grand Piano Competition”. Matsuev also plays jazz music, and has cited Oscar Peterson as a key influence on his jazz playing. Matsuev was the first classical pianist to give a jazz concert at Great Hall of the Moscow Conservatory. Matsuev performs with the world’s best known orchestras, such as the New York Philharmonic, Chicago Symphony Orchestra, Philadelphia Orchestra, Los Angeles Philharmonic Orchestra, Pittsburg Symphony Orchestra, Berlin Philharmonic Orchestra, London Symphony, London Philharmonic, Royal Philharmonic Orchestra, Royal Concertgebouw Orchestra, Leipzig Gewandhaus Orchestra, Bavarian Radio Symphony Orchestra, National Symphony Orchestra, WDR of Cologne, BBC Symphony, “Philharmonia” Orchestra of London, Verbier and Budapest Festival Orchestras, Filarmonica della Scala, Maggio Musicale Fiorentino, Accademia Nazionale di Santa Cecilia, Orchestre National de France, Orchestre de Paris, Orchestre Philharmonique de Radio France, NHK Symphony, the Rotterdam Philharmonic, Israel Philharmonic Orchestra as well as the European Chamber Orchestra. He is continually re-engaged with the legendary Russian orchestras such as the St. Petersburg Philharmonic, the Mariinsky Orchestra and the Russian National Orchestra.